In the last decade, a range of artist-initiated projects using digital technology have emerged in the field of dance. These projects seek to develop and share interdisciplinary understandings of performance praxis, and to enable new modes for creation, documentation, analysis, preservation, and publication. 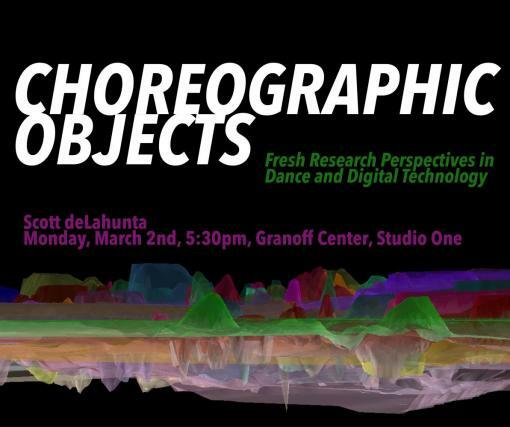 This talk will present a selection of innovative digital experiments involving the choreographers William Forsythe (DE), Wayne McGregor (UK), and Deborah Hay (US), stimulating discussion and debate around the concept of Choreographic Objects. The talk is given by Scott deLahunta. Following the presentation, there will be a short panel discussion between deLahunta, Todd Winkler (co-director, MEME, Brown), Paula Gaetano Adi (Assistant Professor, RISD), and Dorothy Jungels (Artistic Director, Everett) on some of the creative and critical challenges raised by contemporary art making at the intersections of dance, performance, and technology. deLahunta works as a writer, researcher, and organizer on a range of international projects bringing choreography and digital technology into conjunction with other disciplines and practices. He is currently Director of Motion Bank / The Forsythe Company and Senior Research Fellow in partnership with Coverntry University (UK) & Deakin University (AUS). www.sdela.dds. The talk is presented by Noémie Solomon as part of the Mellon Dance Studies Colloquium at Brown University. Monday, March 2nd, 5:30pm. Granoff Center for the Creative Arts, Studio One.